​A propaganda-style music video "I'm From a Village" by a 13-year old girl was the breaking news of the week in online media. Other notable development include public debate on the proposed China Industrial Park in Belarus and the EU's new initiative "European Dialogue on Modernization of Belarus". At the same time Belarus was denied entering the Bologna process. Patriotic rap song "I'm From a Village" ‘blew up’ internet. 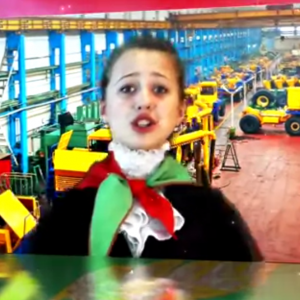 Ksenia Dziahelka, a 13-year-old Belarusian schoolgirl and member of a pioneer organisation from the town of Oktyabrsky (Gomel oblast) sings, in a propaganda style, about the stability and prosperity of Belarus. Amateur video of this rap song has attracted significant attention and sharp reactions from Internet users. The video gathered more than 450,000 views on YouTube in less than a week and generated over 3,000 comments. The views grew significantly after a program praising the girl "talent" on state TV on April 19th. To compare: Belarusian history animation video of the Budzma campaign has about 360,000 YouTube views from the end of May 2011. Officials agree with public on China Industrial Park. On April 16, the talk show "Open format" on the state TV channel ONT was devoted to private property and discussion of building of a China-Belarusian industrial park. During the talk-show officials agreed with the arguments of the campaign "Tell the Truth" and residents of Smolevichi area and acknowledged that the authorities should hold open public hearings, if the question is intimately related to the well-being of citizens. Minsk city executive committee gave permission for Chernobyl Way-2012. The march will be held on April 26 from the Academy of Sciences to the park Friendship of Nations. This year the organizing committee consists of BPF, the Movement "For Freedom", UCP, campaign "Tell the truth", Young Front, the party "Fair World", European Belarus, NGO Ecodom. Byalyatski ordered to pay more. A judge of the Pershamayski District Court in Minsk has ordered imprisoned human rights defender Ales Byalyatski to pay a late charge of Br140.3 million ($17,500) and Br7.1 million ($890) in litigation costs. Lukashenka postponed address to the nation. Alexander Lukashenka postponed his annual address to the National Assembly and the Belarusian people, which was originally scheduled for April 19, ordering speechwriters to rewrite parts of the text that focused on privatization and foreign policy. Ignore-2012. Eight youth organizations launched the joint campaign "Ignore-2012" to boycott the parliamentary elections. Young Front, Young Democrats, Young Hramada, European Belarus, the initiative Zmena and the Young Christian Democrats call on older politicians to join forces against Lukashenka's dictatorship like young CSOs. Nobel Committee registers Ales Byalyatski’s nomination for Peace Prize. The Nobel Committee has admitted the nomination of Viasna leader Ales Byalyatski for the 2012 Peace Prize. Byalyatski’s nomination was submitted by a number of Polish MPs and later signed by several members of the Council of Europe’s Parliamentary Assembly. Round table on European dialogue. On April 20, Minsk hosted a round table "European Dialogue on Modernisation with Belarus: Challenges and Prospects", organized in the framework of the National Platform of EP’s Civil Society Platform. The event was attended by around 30 representatives of Belarusian think tanks and CSOs. The participants discussed current challenges and prospects for the new initiative of the EU for Belarus, including the organization of the dialogue, its format and content. Journalists tried to find common ground with the police. Belarusian independent journalists visited three Minsk police departments to meet with their heads. Journalists prepared a special appeal and leaflets reminding about journalists' rights guaranteed by the Constitution and the law on mass media. Fundraising campaign for new children's hospice. On April 17, NGO "Belarusian Children's Hospice" organised a press conference devoted to the construction of a new building of a children's hospice in Borovlyany (Minsk region). The NGO launches new projects to raise funds for the construction, including a new website with appropriate information – about the process of collecting the money, etc. Also, the campaign "400 thousand of caring" will offer to people to purchase "bricks" and thus contribute to the construction of the building. Makey warns EU over ambassadors' return. The ambassadors of European Union member states will be allowed to return to Belarus after the 27-nation bloc displays its readiness to lift its sanctions on the country's individuals and economic entities, Uladzimir Makey, head of the Presidential Administration, told a group of hand-picked reporters in Minsk on April 17. Belarus to loosen EU border control. Belarus plans to loosen control over travelers and goods crossing the country's border into the European Union in response to the 27-nation bloc's sanctions. Speaking on condition of anonymity, the official from the State Border Committee warned that the Belarusian border control service would give priority to control over people and goods traveling to Belarus from the EU. Belarus banned from Bologna process for three years. Belarus is banned from the Bologna process for at least another three years. The question of accession is completely removed from the agenda of the Summit of Ministers of Education of the European Higher Education Area, which will be held on April 26-27. Belarus will get a chance to join the Bologna process again only in 2015. Belarus and U.S. mutually raised cost of visas. On April 13, U.S. raised the size of the consular fees for the issuance of nonimmigrant visas for Belarusian citizens. In response, the Belarusian authorities have increased the cost of visas for the U.S. citizens. The recent release of two opposition activists is an important event but hardly a turning point for the political situation in Belarus. More than a dozen political prisoners remain incarcerated. Even if Alexandr Lukashenka frees all political prisoners and welcomes EU ministers in Minsk, it will not be a turning point, either. First, Lukashenka can very soon change his mind, take new prisoners and start the liberalisation game anew. Second, the release of opposition activists taken hostage by the regime may have humanitarian or personal significance but no political impact – as long as they do not undertake real work with people inside Belarus. The fundamental problem is that only three actors play this liberalisation game – the Belarusian regime, Russia and the EU. The Belarusian opposition's role is that of a ball with which they are playing. The reasons for the latest friendly gestures towards West by top officials are the same as before. Worsening of Belarusian relations with EU has narrowed options of Belarusian ruler to a pitiful role of Moscow's vassal. After Putin became the Russian president, he declared his intent to intensify building of Eurasian Union which can be dangerous for Lukashenka's power and survival. No wonder, the Belarusian leader looked westwards again to return to his older model of multi-vector foreign policy. He is gradually accepting some demands of the EU as in 2008, when he also released political prisoners and began dialogue with the EU. The pressure on the opposition diminished – yet it did not result in strengthening opposition inside the country. Then came the 2010 elections, confrontation and suppression of the opposition within Belarus. The same happened in 2004 and 2006. The vicious cycle will repeat again as the interests of stakeholders and power balance on the part of the EU, Russia and Belarusian regime remain the same. The situation can change only when the opposition inside Belarus emerge as an organised and self-conscious force. The opposition should become a visible player not only in Brussels and Washington. True, Lukashenka's regime blocks many movement of his opponents but there are absolutely no grounds to compare it to Stalin or even Third World dictatorships. Working with the population in Belarus is possible. Currently, many in the opposition are preoccupied with retaining their financial support without being able to produce any proof of their own efficiency and popularity inside the country. The year 2011 demonstrated that the opposition could not organise any serious political campaigns despite widespread anger at government policy displayed by Belarusians because of economic and social problems. The silent protest actions remained spontaneous mob actions without content, and “People's Assemblies” simply failed to attract any considerable numbers of people. Apparently little has changed in this regard in recent months. The websites of oppositional parties – their main representation platforms given the current situation with media – demonstrate just that. The websites of three major oppositional parties – Belarusian People's Front Party, United Civic Party and Social Democratic Party – resemble internet news sites rather than outlets of political organisations. Parties usually reprint various news already available elsewhere on Internet and may occasionally publish their own analytical pieces or statements. Yet they give little indication of actual activities inside Belarus and work with people. Of course, topics such as prospects of the Eastern Partnership, the role of the Belarusian People's Republic' government in exile and the Belarusian origins of Scarlett Johansson are very interesting. But they have little to do with the situation in Belarus or the parties' own activities. The situation looks better with political movements. Both "Tell the Truth" of Uladzimir Nyaklyaeu and "For Freedom" of Alaksandr Milinkevich look more dynamic. Their sites demonstrate concrete examples of working with the Belarusians inside the country. "For Freedom" is organising public lectures and "Tell the Truth" is conducting a campaign on the newly proposed Chinese Industrial Park which seriously worries local residents. But their own reported activities still resemble the old parties. What this means is that the problem of little work with the people have plagued all major oppositional political structures. 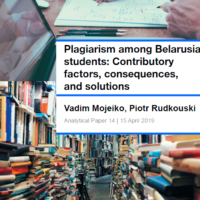 Anthropological insights help to understand activities of Belarusian opposition and society. Some South Pacific islanders, after seeing Western vessels with valuable items arriving to their lands, developed the so called "cargo cult". That was a form of religious belief that salvation shall come from foreign land on a ship or aircraft. That is a pattern to describe activities of Belarusian opposition in recent times. Activity of most oppositional politicians concentrate on foreign governments and stakeholders. It is assumed that the opposition anyway cannot do anything within the country. That means that they need not undertake any efforts to improve their performance inside Belarus. Instead, the oppositional politicians put pressure on Lukashenka from abroad using the EU. But such behaviour is more likely to produce their further marginalisation inside the country rather that any real, albeit small, change. Tendencies to focus primarily on foreign advocacy lowered efficiency of opposition and their chances to achieve changes within the country. The gap between the opposition and reality in Belarus may end badly for all. Just one example. Many radical activists call for Western sanctions but not for funding the deeply needed new initiatives – like new media projects or the improvement of the existing ones. Mass media in Belarus should become much more vigorous, provide society with independent information about what is going on in the country, and serve as a discussion platform. For instance, the only Belarusian-language TV channel Belsat is broadcasting original content under extreme pressure put by Belarusian authorities on its journalists in the country. It has much better chances to help changing the situation in Belarus than dozens of websites. Nevertheless, Belsat is chronically underfunded even now. And there is no such thing as too much funding for media, education, cultural and academic exchange projects. Of course, such a policy is more expensive than sanctions. Sanctions are an easy solution particularly when they are imposed against a relatively small country. They can nicely demonstrate how the EU can punish a dictator. But breaking the vicious circle requires not just sanctions but real work inside the country. The opposition will have a hard time getting more money for this kind of projects. Finding money inside Belarus is virtually impossible. For foreign donors supporting real projects directed at Belarusian people could be more expensive and risky than supporting various exile opposition groups or yet another website. But it is important to understand that only working with Belarusians rather than Brussels insiders can seriously increase respect for the Belarusian opposition. It should appear as a responsible and trustworthy political actor inside the country. Once the public opinion starts to change in the right direction, the question of changing the situation in Belarus will become a question of time. Otherwise, the cycles of taking and releasing political hostages will be repeated again and again.